Paul Allen speaks during a Bloomberg BusinessWeek "Captains of Industry" event in New York on April 17, 2011. Paul Allen, who co-founded Microsoft Corp., a key supplier to the auto industry who used the fortune he made from the technology giant to invest in TrueCar, professional sports teams, cable TV and real estate, has died. He was 65. Allen died on Monday in Seattle from complications of non-Hodgkin’s lymphoma, according to a statement from Vulcan Inc., his investment firm. Allen’s source for his varied investments and sizable charitable donations was his once-major stake in Redmond, Wash.-based Microsoft. He had a net worth of $26.1 billion, according to the Bloomberg Billionaires Index. Allen, along with Bill Gates, co-founded Microsoft and helped create an entire industry selling software for a new breed of smaller, more affordable and widely accessible computers. Microsoft products and operating systems such as Cortana, Office and Skype cut a huge swath through the auto industry today. Customers include Renault-Nissan, BMW, Fiat Chrysler, Toyota and Volvo. Ford Motor Co. tapped Microsoft in 2007 to launch Sync, a voice-operated entertainment and phone service. In 2014, Ford dropped Microsoft in favor of Blackberry for a new-generation of the infotainment system. Vulcan Capital, Allen's investment arm, was also an investor in TrueCar, the online vehicle shopping site. Paul Gardner Allen was born on Jan. 21, 1953, in Seattle to Kenneth and Faye Allen. His father was a university library executive and his mother was a teacher. In 1975, they founded a company they called Micro-Soft in Albuquerque, N.M., after Allen saw a new Altair computer kit on the cover of Popular Electronics magazine and realized computer prices would drop and software would be necessary. 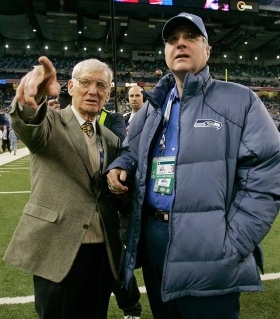 Pittsburgh Steelers owner Dan Rooney, left, chats with Seattle Seahawks owner Paul Allen before the start of Super Bowl XL between the Steelers and Seahawks in Detroit on Feb. 5, 2006. 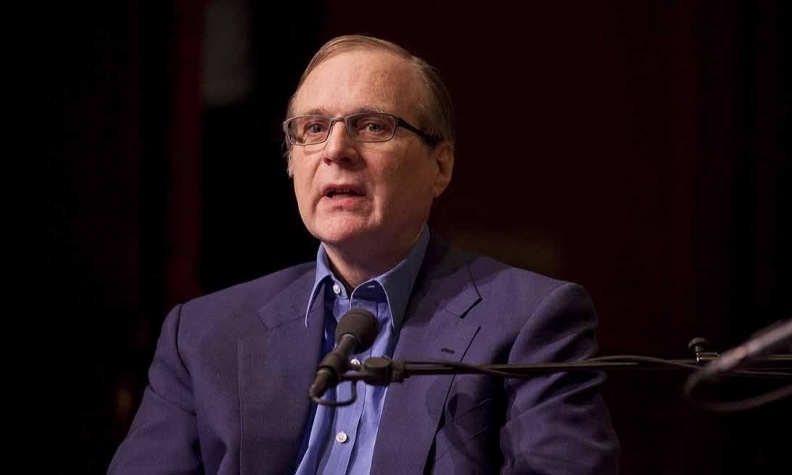 "Paul Allen’s contributions to our company, our industry and to our community are indispensable," Microsoft CEO Satya Nadella said in a statement. "In his own quiet and persistent way, he created magical products, experiences and institutions, and in doing so, he changed the world." "Paul wasn’t content with starting one company," Gates said Monday. "He channeled his intellect and compassion into a second act focused on improving people’s lives and strengthening communities in Seattle and around the world." A rabid sports fan, Allen bought the Portland Trail Blazers, a National Basketball Association franchise, in 1988 for $70 million. That investment was a success -- the team repeatedly made the NBA playoffs after his purchase, and by 2018 Forbes estimated the team was worth $1.3 billion. “Paul Allen was the ultimate trail blazer – in business, philanthropy and in sports," NBA Commissioner Adam Silver said in a statement. "As one of the longest-tenured owners in the NBA, Paul brought a sense of discovery and vision to every league matter large and small." 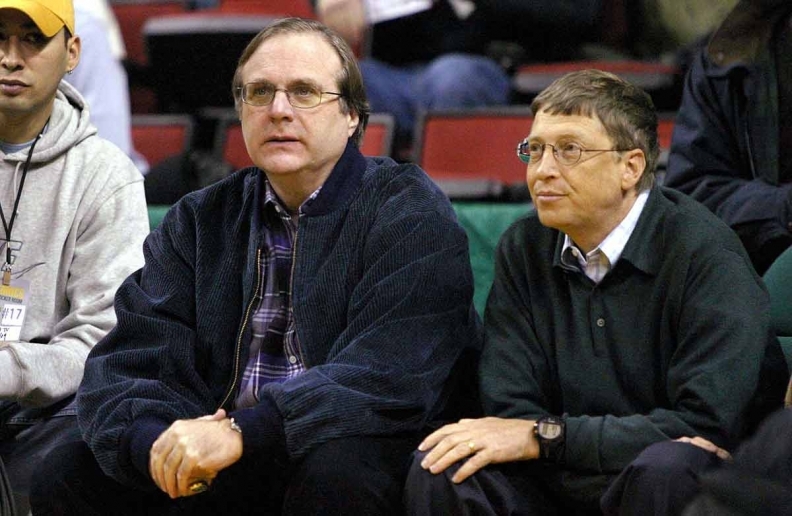 Paul Allen, left, owner of the Portland Trail Blazers and co-founder of Microsoft, with Bill Gates, right, chairman and co-founder of Microsoft, at a Blazers basketball game in Seattle on Jan. 5, 2004. "He’s been under-recognized for all the things he’s done for Seattle," said Tom Alberg, managing director of Madrona Venture Group. "We tend to look at political leaders, and here we have someone not giving speeches, but building things important for Seattle and our future. Not a lot of people do everything from philanthropy to sports to technology to urban development." David Phillips of Automotive News contributed to this report.